This was spotted at the Naval Museum recently. Does anyone have an answer? What is unusual is his Branch Badge. Ian (Manga) Heperi (RIP) was a Signalman, but is wearing a Radioman badge. Could this be the period when RO(G)s and RO(T)s wore the same badge. If not, then it raises the question of what was he doing in a Sparker’s shirt? didnt have a clean one so borrowed a sparkers shirt.. When did Ian join? I think signalmen went back to crossed flags in 65 or 66. I see he has a hook on his left arm and also wearing a Philly cap tally. That should narrow it down. Yer rite Jimbo …. that was back in the days when we had RO1(G), RO1(T), etc. The same “Sparkers” badge was short-lived. According to my “Micky Ducks”, those titles were changed on the 1st Jan 1964, then changed again 1st Jan 1965 to ARD, ASG, etc. 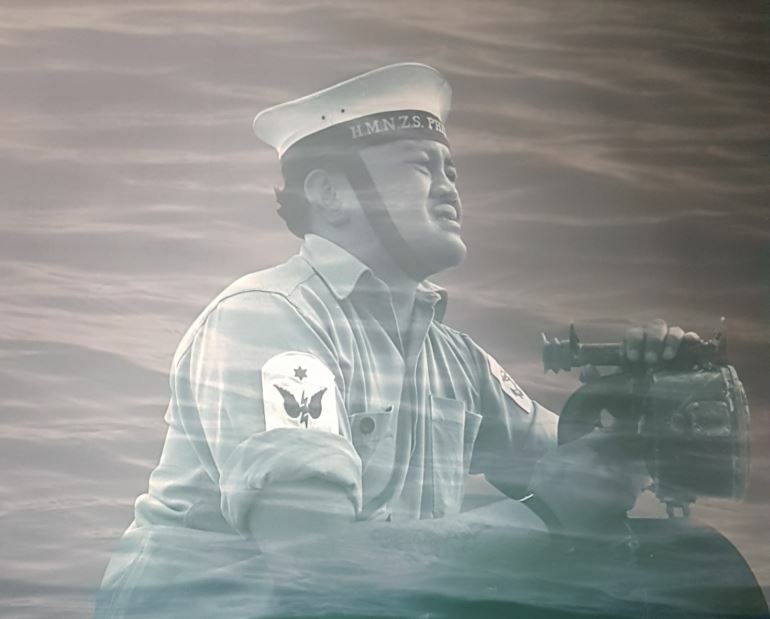 Yes, true, but the NZ Navy Order didn’t come out until July 1965, which also stated that radiomen and signalman were to be annotated in service docs as being in force from 1 Jan 65. We didn’t find out about the change in rates until mail came onboard in Singas either July or August 65. Further to yours above Jim … my “Mickey Ducks”states RO1(G) dated 1st Jan 1964 with reasoning stating just “New Titles”.only. With reference to the next change says ARD 1 Jan 1965 with reference to NZNO V7/65. I joined January 65 and our class (CS82) when U/t at Tamaki we all wore the “winged Comms badge” until around mid to late 1965 when we went from either JRROs and ORROs to JRD or ORDN and by then we were at Philly and up in Northead doing our separate branch training. I should have included JSGs and OSGs as well in my reply. Sorry to my fellow Buntings.